To a single end user, measuring the availability of power is an easy exercise: Flip the nearest wall switch and observe whether the lights come on or you remain in the dark. Determining the quality of that power, though, is a more complex endeavor. This process of tracking whether current is being provided at levels connected equipment requires is only becoming more important in today’s increasingly sophisticated commercial and industrial facilities. 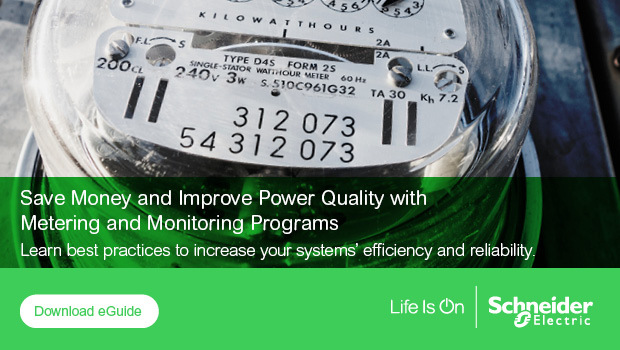 This post will provide an overview of a concept Schneider Electric has termed “demand side power quality,” along with a look at the Power Metering and monitoring Devices (PMDs) now available to aid power-management efforts. The qualifier “demand side” is important to this concept of demand side power quality because it highlights the fact that most current irregularities are caused by problems within a facility, itself (the “demand” side of the electrical distribution system), rather than by the power supplied by the electric utility. These problems can include voltage fluctuations or dips, frequency deviations and current-harmonics disturbances, and their consequences can be significant. Fan motors, lighting-control systems, cabling and other components all can suffer performance setbacks and premature failure if electrical current isn’t delivered at consistent and appropriate levels. High-precision manufacturing operations are especially vulnerable to such problems. Power Factor (measured as PF). As power factor declines from the ideal ratio of 1.0, energy is wasted, and energy providers may begin assessing penalties. Additionally, such a condition can mean cables that aren’t oversized can begin to overheat. Voltage and current harmonics (measured as THDu or THDi). Negative sequence harmonics will slow down motor operations, leading to early failure. Zero-sequence harmonics result in wasted energy. Permanent or frequent voltage deviation (U). Voltage fluctuations can cause connected equipment to work outside specified ranges, which can lead to early failure (especially with motors). Voltage imbalance (Uimb). These conditions can lead to inefficient motor operation and early equipment failure. Dips (Udip) and interruptions (Uint). These events can lead to very expensive process interruptions. Frequency (f). Changes in frequency can cause speed changes in rotating machines. In some cases, as with variable frequency motors and drives, this is intentional – but, even in such applications, frequency should be monitored to ensure it varies as anticipated. Flicker (Pst) or RVC. Flicker can create annoying – and, possibly, dangerous – lighting conditions. As demand side power-quality issues have become more important to both equipment efficiency and service life, standards have developed to help specifiers ensure the devices they select to monitor power-system operations function as intended. The table below summarizes several of the most important of these standards. Electrical Distribution Monitoring, asset management, facility planning when consistent measurement is requested at plant level (comparison between several devices measuring at different locations). Schneider Electric offers a broad range of smart panels and power-monitoring equipment, including PM8000. Our Partner portal for consulting engineers offers a range of resources to help specifiers address facility-specific power monitoring and metering requirements. Visit it now, for direct access to professional engineers who can answer any questions you might have on these devices. Plus, you’ll be just a click away from our improved building information modeling library, how-to videos and a range of other resources.